As of January 1, 2007, 25 States and the District of Columbia had enacted primary enforcement of their seat belt laws. Primary enforcement provisions permit law enforcement officers to stop a vehicle solely on the basis of observing a seat belt violation. Primary seat belt laws have been found to increase observed daytime seat belt use, but there is little research to support that such laws have any impact on nighttime seat belt use. Eighteen U.S. jurisdictions have upgraded to primary laws after having had laws with secondary enforcement provisions, which require law enforcement officers to have another reason for stopping a vehicle before citing an occupant for a seat belt violation. 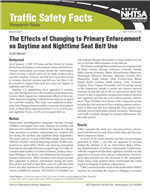 This study was conducted to determine how changing from secondary to primary enforcement in six of these States impacted daytime (5 a.m. to 8:59 p.m.) and nighttime (9 p.m. to 4:59 a.m.) occupant belt use. It was found that changing from secondary to primary enforcement of seat belt laws was associated with increased seat belt use during both the daytime and nighttime hours in five of the six States evaluated in this study, even after accounting for preexisting local and national trends towards increased seat belt use.